This is such a Danish thing and I absolutely love it! Yesterday was the last day at Herning Gymnasium for 5 of our staff members- 1 is retiring while the other 4 are moving to schools in other cities. Each one of them was honored by his/her content group (English, math, etc) with a song. Each group chose a song for its designated honoree and rewrote the lyrics to represent things that are unique about that person, stories from the time they had worked with us as well as little anecdotes that made everyone smile as they remembered the thing to which they referred. The best part is not the lyrics themselves, but that each group (English, math, etc) SINGS the song to the staff member they are honoring. It is AWESOME! So not only do you get to see your colleagues stand up there and sing a song to/for you, but then you can save those lyrics and every time you hear that tune again, you remember that day when the song was all about you. My goal is that someday I am "dygtig nok" to help write one of the songs for a future event. I think it is a really special thing that we do in Denmark! If someone would publish this, I guarantee you that EVERY SINGLE foreigner in Denmark would buy it! What a great way to pay tribute! At our end of term concert in the church this year, the third graders sang a song with new lyrics for their music teacher. So touching. LOL! 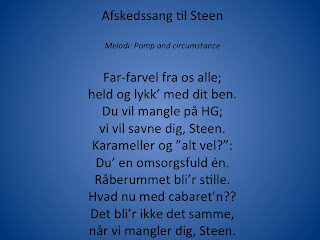 The song tradition is one of my LEAST favorite things in Denmark! To the point where we banned songs and speeches from our wedding (thankfully my Dane is also not a fan of the song and speech routine). 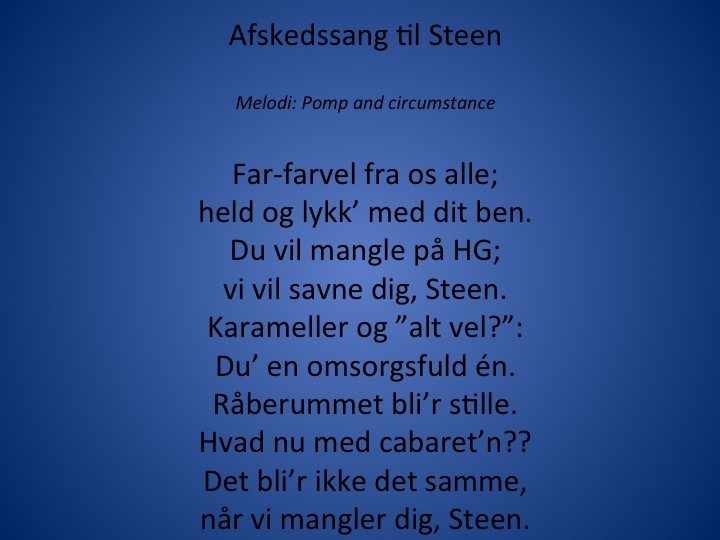 The irony is that I'm pretty good at writing them (for a person who's Danish is highly limited) because we read and wrote poetry in my Danish class. But group singing... ugh! I hate singing for people and I hate people singing at me! The yearly "Happy Birthday" is always so painful. Can't we just skip it and eat the cake?? I find the song tradition highly entertaining, and I love how they fold them up and display the lyrics so creatively.